Graceful exit for disgracefully grim prospects? WHILE Sen. Hillary Rodham Clinton has not given up, advisers say, she has the perspective of a realist: someone has to lose. COLUMBUS, Ohio – Sen. Hillary Rodham Clinton insisted Friday that she had not meant to signal surrender when she shook hands with Sen. Barack Obama during their Democratic presidential debate in Austin the night before. It was a measure of the dire circumstances her campaign now faces that she had to explain the gesture at all. Clinton said she still expects to win the Ohio and Texas primaries, but her increasingly pessimistic advisers did nothing to rebut a remark by former president Bill Clinton that his wife must win both states to continue her candidacy. Adding to the dark mood that has descended on her campaign was a fatal accident involving a police officer as her motorcade proceeded through Dallas on Friday morning. Clinton canceled a rally when she learned of the death of Senior Cpl. Victor Lozada-Tirado, telling supporters in Fort Worth: “It is, for me, a very personal moment.” She went with the Dallas mayor and the chief of police to Methodist Hospital to meet with the officer’s wife. In recent weeks, Clinton has increasingly turned to recounting anecdotes about people she has met, shifting attention away from her and back to voters, a formula that Bill Clinton used to great effect. She recalled some of those individuals – a soldier in San Antonio, a working mother in McAllen – at a street-corner event in Dallas. And later in the day at an economic roundtable in Columbus, Ohio, where she stood in front of a banner that read “Solutions for the American Economy,” she solicited stories from visitors about their economic problems, including one woman’s tale of losing her home to foreclosure. But the motorcade accident hung like a dark cloud at every moment, with Clinton pointing to the four children the officer left behind as an example of the need for a social safety net. Her supporters gasped as she described the accident in Dallas earlier in the day. “It was just heartbreaking,” she told the hushed auditorium. 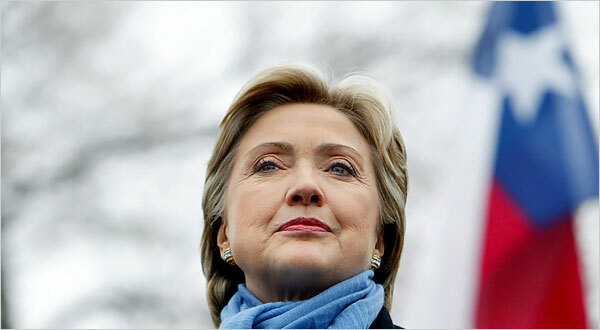 Clinton will travel to New Orleans on Saturday before heading to Rhode Island, another March 4 state, on Sunday. She and Obama are scheduled to participate in a debate in Cleveland on Tuesday night – possibly their last. Despite reports of campaign overspending and fundraising woes, Clinton released three new television ads, including a Texas spot showing a man loading hay bales into a red pickup truck and one for Ohio featuring former senator and astronaut John Glenn. Some Democratic political sources said discussion has begun about encouraging Clinton to transition into a different party leadership role, one that could carry her on a path to becoming Senate majority leader. That course had been discussed even before Clinton announced her presidential campaign. “People who care about her are worried about her long-term future,” the adviser said. Yet the obstacles to her success are mounting. Earlier this month, Clinton held a daunting lead over Obama among superdelegates, the elected officials and party insiders who account for 796 of the 2,025 needed to secure the Democratic nomination. Unlike pledged delegates awarded through primaries or caucuses, these individuals may switch sides at any time. In the past two weeks, according to an Associated Press survey, Obama has added 25 superdelegates to his column, while Clinton has lost two. She still leads overall, by a count of 241 to 181, according to the AP. But the gap is narrowing. Obama also is starting to win over key Democrats who have been on the sidelines. Sen. Russell Feingold (Wis.), a prominent liberal, declined to endorse before Tuesday, but declared Friday that he had voted for Obama and was “extremely likely” to support him as a superdelegate.